Solar PV Design Company India, Solar Permit Services and Package, Solar Design and Drawings Services Company! DIN Engineering Services is the world's leading provider of Solar PV installation Design and Drawing Services. We are focused on partnering with solar installers and contractors in the U.S. to bring in efficiencies on the Solar Designs and Engineering Drawings. Turnaround — within a few hours! Turnaround - within 24 hours! Trusted Engineering Design Partner Since 1999. 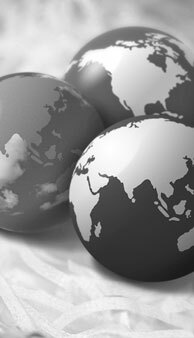 Providing end-to-end services, from Proposals to Inter-Connection. Designed 300,000+ Jobs across AHJs and Utilities. Working with majority of the Top 50 Solar Installers in U.S.
24x7 Operations. 350+ Full-Time PV Design Engineers. ISMS 27001:2005 and ISO 9001:2008 Quality Certified. Customer Satisfaction Index 4.9 / 5.0 . LEAN Six Sigma Practices and Agile Operations. Rated amongst The Top10 Engineering Design Companies. Customers Include Solar Startups / Mid-Size & Large Enterprises. We have extensive experience in designing of residential solar system. We provide variety of services in this sector ranging from sales to interconnection. Our team has in depth knowledge of AHJ and Utility requirements and are acquainted with various codes and compliances. We provide accurate proposal documents for solar installers helping them to gain business. We provide 12-24 hours turnaround to the customers enabling them to pace up the signing up process. We just need the address of the locality and we will create the proposal drawings by which the estimated system size can be determined. We also understand the various AHJ (Authority having jurisdiction) and HOA (Home owners association) requirements / guidelines and has been working using varied static and dynamic blocks and templates. We do shading analysis and solmetric calculations to ensure the proper positioning of the solar panels. We are conversant with the Solmetric PV Designer / Solmetric SunEye and with calculation applications like PVsyst. Changes occur in the proposed solar system many a times. DIN Engineering Services can step in at any stage and can take the design forward. We can work on changing racking, electrical equipments, mounting planes etc... and can provide you quick turnaround of as low as 12 hours. The as-built drawings show how the system was actually installed and reflect any changes made to the design during installation. 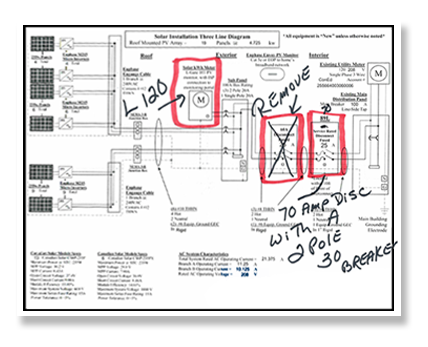 If as-built drawings are not produced, the client will not have a record of how the system was actually installed. To enable the client having the most recent drawings, we provide the as-built drawings services to our customers. We require either the hand sketch of the changes made during the installations or the photographs so that we can amend those in the drawings. DIN Engineering Services has experience in designing systems from 20kW up to several hundred kW in this sector. We provide detailed commercial design sets compatible to the codes. With our experience we can assist you in choosing the best equipment for Balance of system as it is based on a number of site specifics including wind/snow, and general climate characteristics that direct the pairing of inverter/module, roof/racking and specific incentive schemes to match the system size. We have successfully designed several commercial projects with different types for racking systems on roof, carports and ground mounts. We are equipped to prepare the PV array layouts, mounting details, BOS Elevations shading analysis, Electrical 3 line and single line diagrams etc. We have expertise in providing you with the complete design packages for commercial installations. Extensive experience in designing the PV System on a free standing structure like Carports, Single Axis tracking, Dual axis tracking system and Ground mount racking. We have worked on several roof top commercial designs ranging from few kW to MW. We have designed this with various racking and module manufacturers. We have created right from rough sketches to the construction documents. We provide full installation details of the solar system along with the required drawings needed by the authorities. Designed Ground mounts for flat and sloping grounds using various racking systems. 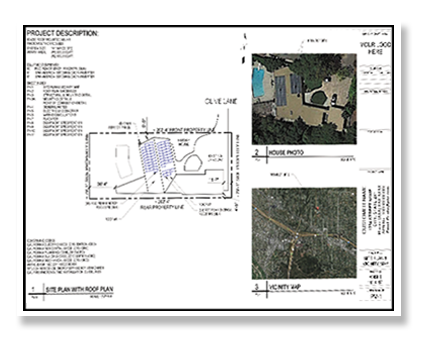 We can provide detailed arrangement drawings for ground mount systems including the overviews from all directions. We can work on the project at any stage and with prompt and effective technical support for the field staff. Plan revisions / details /changes as required to match the compliance codes. Designing a PV power plant has unique opportunities, challenges and risks. As a installer/owner, it is wise to maximize the value of investment. We have worked on numerous utility scale solar projects (1mW to 120 mW). We have expertise in single axis, dual axis and fixed tilt systems. We can provide all the E and L category drawings including 3 line diagrams, interconnection line diagram, construction details and 3D sketch-up models for presentation purposes. 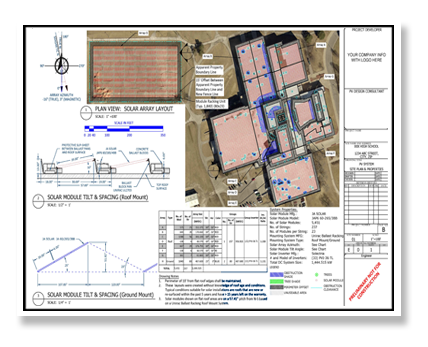 We use the PVsyst version 6 PREMIUM - the most powerful software for photovoltaÏc systems, for the study, sizing, simulation and data analysis of complete PV systems. PVsyst tool helps in preliminary design, quick estimation of production for an early study of the installation, project design, detailed study, sizing and hourly simulation. 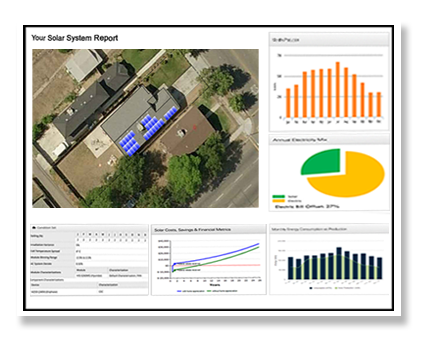 We reply on PVsyst tool capabilities to calculate the PV system results which come in form of a full report, specific graphs and tables, and data export. The advanced functionality of the tool, management of the meteo and components databases and also includes specific pedagogic tools, and import of measured results for a close comparison to the simulation.